A Bangkok court on Tuesday granted a Japanese man "sole parent" rights to 13 children he fathered through Thai surrogate mothers, a ruling that paves the way for him to take custody of the group. 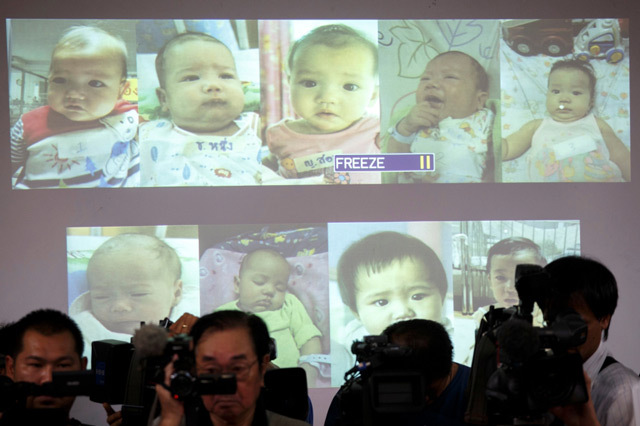 Mitsutoki Shigeta caused a "baby factory" scandal in 2014 after Thai police said DNA samples linked him to nine infants found in a Bangkok apartment, plus at least four other babies born by surrogates. The murky case threw the spotlight on Thailand's then unregulated rent-a-womb industry, and helped push authorities to bar foreigners from paying for Thai surrogates in 2015. Shigeta, the son of a Japanese tycoon, left the country in the wake of the scandal but later sued Thailand's Ministry of Social Development and Human Security for custody of the children. "For the happiness and opportunities which the 13 children will receive from their biological father, who does not have a history of bad behaviour, the court rules that all 13 born from surrogacy to be legal children of the plaintiff," Bangkok's Central Juvenile Court said in a statement. Shigeta, who did not attend the trial in person, was deemed the "sole parent" of the children after the Thai surrogates had signed away their rights, the court said. As he comes from a wealthy family, he has ample money and has prepared nurses and nannies to care for the children in Japan, the ruling stated. Shigeta's lawyer said he would contact the Social Welfare Ministry, who has taken care of the children since the scandal broke in 2014, about the next steps in transferring them from state custody. Shigeta hired the Thai surrogates before the kingdom banned the lucrative trade in 2015, following a string of scandals and custody tussles. Surrogacy agencies quickly migrated to neighbouring Cambodia, who followed suit and barred the industry in 2016. In recent months there have been signs the industry has shifted to Laos, an opaque communist country with no restrictions on surrogacy.